This is a very realistic book. Quite appropriate for a book about a reality television show. Obviously, having a television show filmed at your school is unusual, but I could see it happening. Everything about this book felt like something that could easily happen. The characters seemed like real teenagers. The plot twists felt like things that could actually happen. It was fictional reality. I loved all the characters. I hate saying they felt real since I've already gotten into that, but it is one of the things I liked best. None of them are too flashy. They are quirky, intelligent, resourceful, and funny. All of these without being so much so that they become characters. They are fully fledged characters with faults that felt very human. Ethan, our narrator, is a normal teen. I felt like he was a bit unreliable though, because like many teens with blah self-esteems he described himself as a dull bulb among a bunch of neon lights. As the book plays out, he comes across as more talented and smart than he thinks of himself. To my surprise, the book turned into something of a heist plot. The main characters (Ethan, Jackson, Elizabeth, and Luke) not only create an epic poem mocking the reality show, but they subsequently hatch up a stealthy scheme to stop the show and/or beat the teachers at their own game. More than a caper plot, this is really a book about human nature. It explores why the characters got involved in a TV show, with reasons ranging from ambition to greed to glory seeking. At some point, one wonders if the characters' motives to stop the show are just as flawed. It also explores teenage romance - stopping short of an actual romance - but getting into the fears, excitement, and adulation that go through a teen's crush. The book is not a page turner. I put it down for a week. But once I got into it, it was oddly compelling. The strange normalcy drew me to it. My only significant criticism is that it had a tendency to be too talky. I learned a lot about the characters by being told, not by being shown. Blatantly so. One thing I loved was that it was set in Minnesota. And the author did her research! I'm not sure if the author is from Minnesota (her bio never mentions it), but she captured it really well. I loved that she mentioned real places that I've been too - like Annie's Parlour in Dinkytown. A wonderful use of place in a novel - it adds fun to readers familiar with the setting but doesn't distract readers who know nothing of the setting. 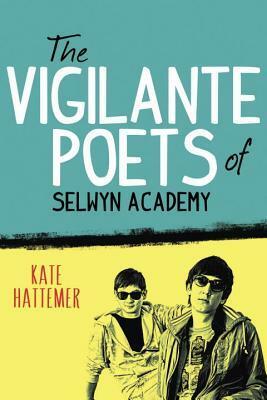 The Vigilante Poets of Selwyn Academy is one of the better realistic fiction books I've read in awhile. Much like Minnesotans, the book is never bombastic or showy. It slowly and quietly seeps into your soul. Recommendation: Buy if you're into subtle, smart fiction. Otherwise borrow. I was hesitant in requesting this one when I saw it on NG. The blurb wasn't exciting and neither was the cover. I'm glad you enjoyed this one even though it didn't grab your attention right away. I'm not sure this one is for me though. Very good review. I don't think I ever put a book down for a week. A few days but I always get back to it.